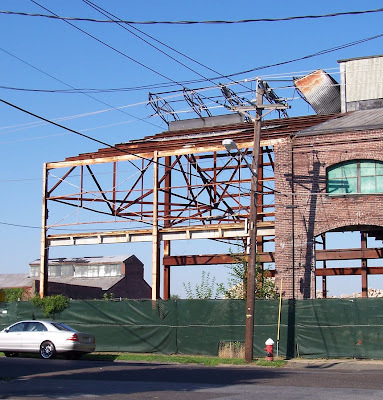 The State acquired the Roebling School Site earlier this decade with the full intention of renovating the complex into a state of the art school for over 1,200 students. In 2004, things fell apart. 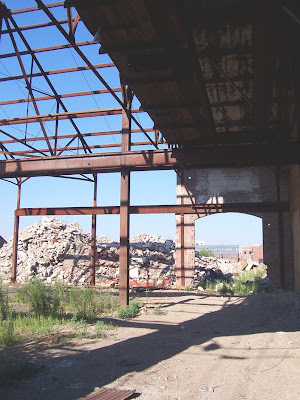 The SCC (now SDA) ran out of money, and Roebling was one of the unlucky projects to have begun some pre-construction sitework when the money stopped flowing. 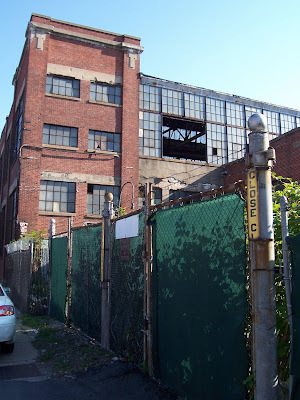 Now, I would submit that the proposed Roebling School was far from a "normal" SCC/SDA project. It represented the culmination of over 10 years of planning on the part of the School District and City Officials. As a project, it was born out of a relatively simple problem: how can you build a brand new school in an existing, densely populated neighborhood? Rather than taking a residential block of housing (probably through eminent domain), the City proposed that architecturally significant buildings be adapted into a new school. The State bought into the idea, plans were drawn, and the project won an impressive array of awards and the project even got the attention of the national media (see below for a partial list of publications and awards). This is where stewardship comes in. 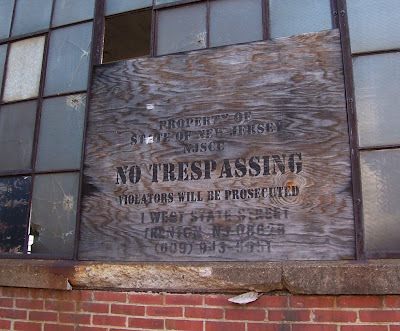 The State took this property off the Trenton tax rolls. The State effectively took a business out of our City to make way for this project. And over the past 6 years, the State has watched over this site as it deteriorates. 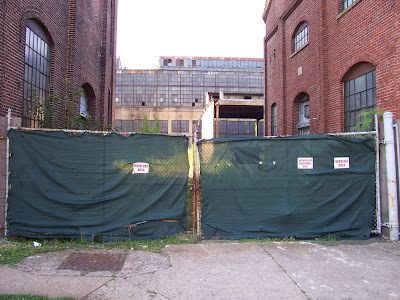 The Mott Street Gates are loose enough for squatters to easily walk into the site (and into the buildings). The condition of the temporary fences are awful. 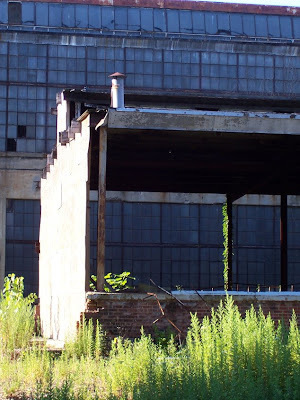 Portions of building 62 across from De Lorenzo's (Hudson) appear as though they are in danger of collapse- specifically, the highest portions of the exposed steel structure at the Southernmost end- the portions that are leaning. 20 foot high piles of debris are visible from almost every adjacent street and home, and have been for almost 4 years. 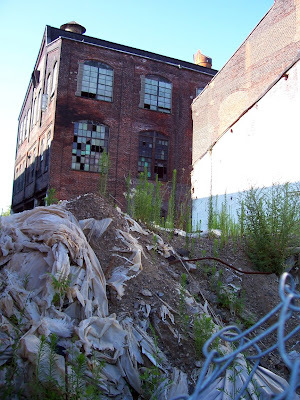 The interiors of the buildings are open to the elements and have endured freeze-thaw cycles, water penetration, rodent infestations (I saw at least 8 fat cats prowling the site), pigeon guano etc. 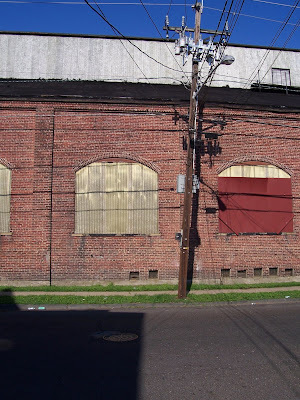 Beyond the neglect of the site, these buildings represent a huge part of Trenton's industrial history. 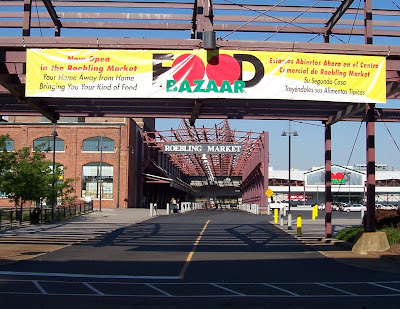 The recent opening of the Roebling Machine Shop (for the fantastic Art All Night) and the grand opening of Food Bazaar at the Roebling Market demonstrate the flexibility that these industrial shells provide. Huge windows. High ceilings. Incredible light. 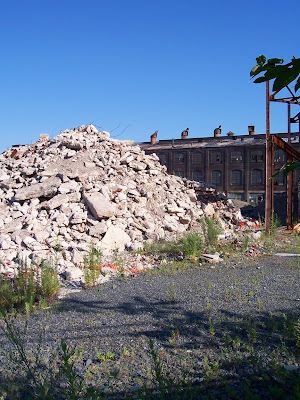 If the State has decided, regardless of fact, that they will demolish the Roebling School site buildings, they will make the same mistakes that wiped out portions of Trenton in the 1950's and 1960's. They will ignore cultural meaning in favor of the "easiest solution" or the cheapest way to build. 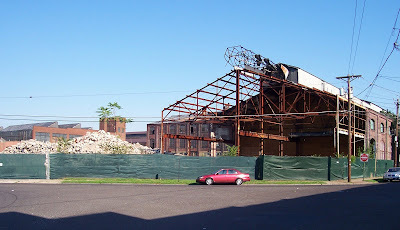 They will destroy part of the complex that was responsible for Trenton's great rise, and they will also destroy the potential for our children to learn, first hand, about a period in Trenton's history that was very positive. This new plan is, put simply, a horrible idea. See below for recent images on and around the site as proof of the quality of the State's stewardship at this site. 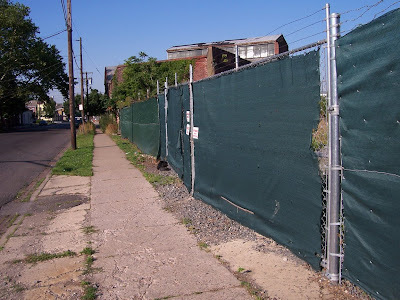 I'll end on an easy question: would the State maintain a site this poorly in Princeton?